There is a lot to like about the new Azimut Grande 27M making its public debut at the Cannes Yachting Festival 2017 and Fort Lauderdale International Boat Show — dynamic lines, exceptionally elegant and detailed interior décor, a sporty turn of speed and the innovative way it is made. 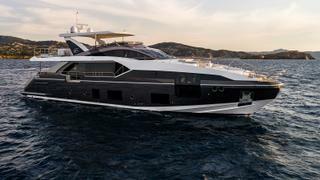 The headliner from Azimut is that this is one of a kind: the “only 27 metre, raised pilothouse, widebody five cabin boat on the market,” says Giovanna Vittelli, the company’s vice president. The new Azimut is also, according to the founder of Azimut, Paolo Vittelli, the largest boat in the world to have built “open.” But what does this mean? Once the hull, which is infused, was popped out of the mould and flipped right side up, everything was installed in it, including finished furniture, before the 16 tonne finished superstructure was lifted onto it and secured. This is the way that Azimut builds all of its smaller models in its high-tech plant in Avigliana, but it the first time the builder attempted this on a yacht of this size. The approach allows Azimut to reach a new level of efficiency — with the ambition to built 10 to 11 of these boats a year, after an initial run of eight in 2017, without taking away the feel of a custom finish. It also is a good way to optimise space and installation of all systems. “We need very precise construction tolerance. Everything in GRP is produced from CNC milled moulds. 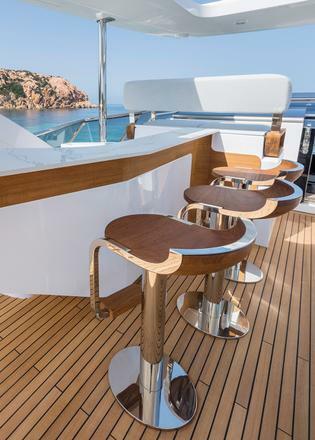 The structure of the furniture is CNC cut before it is hand finished,” says Azimut’s chief technical officer, Alessandro Rossi. There may still have been a few nail biting moments when the two halves came together at the shipyard in Viareggio (where the Grande 27M was built), but not too many. 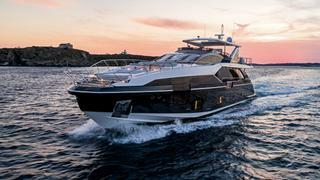 The owner of the first hull, a repeat Azimut client, was confident. 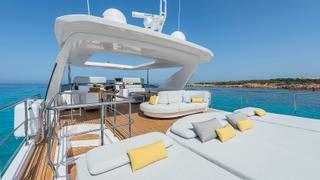 When he set his eyes on his new boat for the first time at the Azimut Benetti Yachting Gala in Porto Cervo, Sardinia, this past June, all he’d seen were drawings and a few construction photos. He never once went to the factory. “I may not be typical,” he says as we sit for a chat on board his boat while a constant stream of visitors flows through. He is probably right. It’s taken him just three years to get from his first Azimut 50 to his fourth and far larger Azimut, which takes a crew of four — not a typical curve. He’s young, energetic and likes to spend extended periods of times on his boats and could hardly wait to get on with an extended cruising program through the Mediterranean. He and his wife bought the boat just as designed. 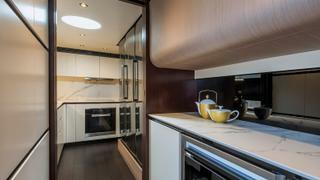 One upgrade they did do was a sophisticated sound system, with multiple speakers, woofers and an Apple TV system. 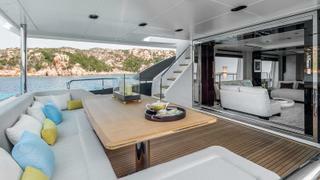 Although this model, like all boats in the Azimut Grande range, can be tailored to some extent, the company went to extreme lengths to anticipate customer needs, offering a four- or five-cabin layout (with various bed configurations) and three complete design packages by Achille Salvagni, the interior designer behind the award winning superyacht Numptia (now High Power III). Salvagni has worked with the Italian boat builder before but the two new Grandes, the 27M and the flagship Grande 35M also just debuting, are the first examples of his fully realised vision. He is speaking of the Grande line’s new flagship 35M, which he also designed, but the same applies to some extent to the smaller sister. The refinement of materials, such as brushed oak, teak treated with a black resin that almost looks like veneer in a stone, varnished mahogany and Carrara marble, and the level of detail is remarkable. Salvagni also produces a line of fine furniture and the shapely pieces on board look sophisticated and are beautifully finished. The turnkey interior even includes a selection of art pieces. 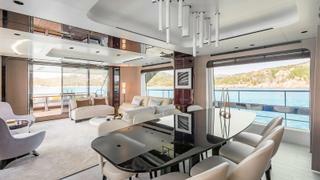 Salvagni has used the generous space afforded by the “widebody” design wisely from the superb full-beam master cabin with floor-to-ceiling windows on main deck to the five cabins below. There, he’s oriented the queen size beds away from the hull sides to gain even more space. 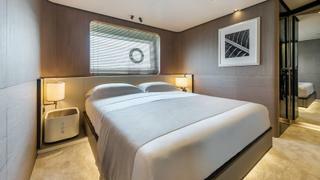 In the twin cabin the beds are installed in a big V, which creates plenty of floor space. The Azimut 27M answers a conundrum: “Volume is what everybody is expecting, yet the Azimut DNA is sporty lines,” Giovanna Vittelli says. The challenge was to reconcile the two, to build a boat with space for 10 guests and generously sized crew quarters for four (two cabins and heads), plus a tender garage suitable for a 4.5-metre Williams tightly fitted between the engines and released via a pivoting system over the swim platform. One of the solutions was to opt for relatively small engines, which are 1,900hp MAN V12s, to minimize the engine room space, but come up with a planing hull design and weight that would allow for a top speed of 27 knots. Part of the recipe for success is, as is often the case these days, composite construction — the use of more carbon fibre for the main deck and superstructure, roll bar and hardtop and, as seems to be a renewed trend at the moment, a raised pilothouse design. 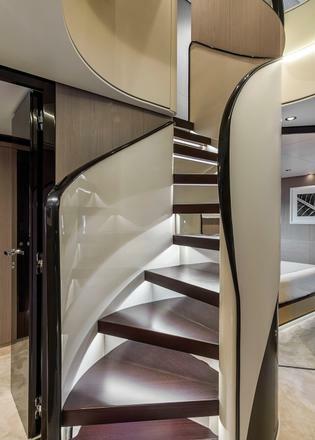 On the styling front, the task of visually slimming this high-volume boat, which does not act as one, went to the immensely experienced Stefano Righini. The Azimut Grande 27M, finished with a gelcoat, looks pretty fast — the styling aptly concealing all that’s within and the size of the flybridge. It is well equipped with, among other equipment, hydraulically operated bow and stern thrusters, CMC fin stabilisers and an integrated monitoring and navigation system by Naviop and Simrad. Fresh out of the shipyard in Viareggio, the very first Azimut Grande 27M took the nine-hour trip to Porto Cervo for its debut in front of 700 owners who responded to Azimut Benetti’s invitation. Sea trials show the maximum range to be around 800 nautical miles at 12 knots and more then 400 at 18 knots. The cruising speed is around 20 knots, with a fuel consumption at that speed of around 400 litres per hour. Whether you like the softer side of things, and enjoy the look of a well-designed piece of furniture, or like the performance aspect and engineering side, the Azimut Grande 27M has a lot to offer.